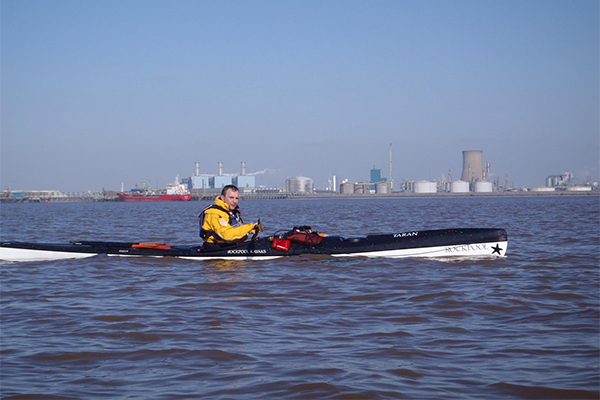 Kingston Kayak Club, based in Hull, is only half-an hour’s drive from the sea, and for those members living to the east of the city even less, so it is not surprising that some of them take part in sea kayaking and canoe surfing. One or two club members have real sea kayaks – long, stable kayaks with closed-in decks, extra buoyancy plus storage space and deck lines – but the majority paddle their general-purpose kayaks. Traditionally, the club organises an annual Boxing Day Paddle at North Landing, Flamborough Head, designed to blow the cobwebs away and clear the head after Christmas Day’s indulgences! As cold weather – even sleet and snow – can be pretty well guaranteed, this event attracts the club’s hardiest members but even so it is usually well-attended. Flamborough, with its bays facing north, south and east, thus taking advantage of whichever way the surf is running, is a popular destination for the club’s canoe surfers, as is Cayton Bay just south of Scarborough. A quick check on the surf predictions will soon tell canoe surfers where the best waves are expected. Contact Ken Oliver for more information.